Easy. Affordable. Beautiful. These words sum up the benefits you can expect when you choose decking tiles made of Brazilian hardwood. 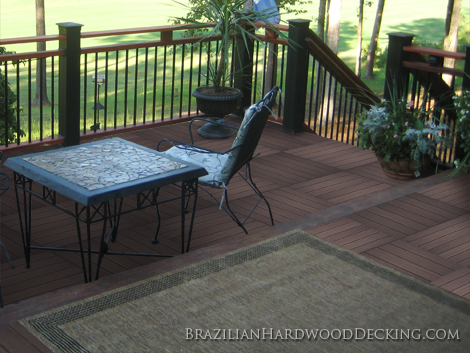 A faster, easier installation process means you can spend less time working on your deck and more time enjoying it. Installing decking tiles is so simple anyone can do it, meaning you can save money that would have otherwise been spent hiring a professional deck builder. Finally, the modular nature of decking tiles allows you to mix and match patterns to create a deck that is uniquely your own. Cumaru tiles available in smooth profiles only. Tigerwood tiles available in smooth profiles only. You'll find that we offer competitive pricing on our line of decking tiles. If you have any questions, feel free to call us!